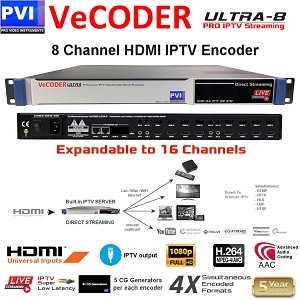 The VeCODER-ULTRA-IP-8H is a professional eight channels HDMI To IPTV Streaming video encoder, built with the next generation H.264 processors with formats selectable channel by channel, up to Full HD 1080p 60, ideal solution to distribute multiple channels of any HDMI video directly to unlimited SMART TVs, Smart Phones, Tablets, Computers, IPTV Boxes, over LAN, WiFi, Internet. Based on the newest multi-server multi-format Broadcast chipsets technology, each channel can encode the HDMI Input in FOUR different formats & resolutions, as example for SMART TVs, Mobiles, Tablets, PCs, to fit the destination bandwidth and type of network, with the ability to serve directly hundreds of simultaneous unicast or multicast concurrent players without the need of additional parts or servers. Each channel can also load & inject up to Five Graphic Logos or Texts for channel identification, Watermarking, Info, QR Codes for commercial links, etc. The VeCODER delivers incredible video quality and power as each channel comes with its own encoding engine, served over multiple Full Gigabit speed outputs, able to support very high traffic demand on the same channel. The VeCODER connects directly to the existing LAN Switch, or wifi, or internet router and streams the HDMI Video input in super ultra low latency to any device, perfect also for Live Applications.  The encoded channels can also be sent directly and simultaneously to any additional distribution servers as YouTube, Wowza, Akamai, and any other, to reach even more audience, unlimited. In Homes, Commercial, Hospitality, a single VeCODER can play directly on any SMART TV over wired Lan or Wifi, without need of any additional part behind the TV - Direct. Multiple VeCODERS can be installed at the same time on the same distribution network, anywhere, adding and expanding the available IPTV Channels at any time. Available in 4, 8, 12, 16 channel configurations, the VeCODER-ULTRA-IP is the perfect solution for any professional Over IP Video Broadcasting and Distribution, where Total Video Quality, Performances, Reliability, and best cost per channel are most wanted. The VeCODER-ULTRA-IP-12H is a professional Twelve channels HDMI To IPTV Streaming video encoder, built with the next generation H.264 processors with formats selectable channel by channel,up to Full HD 1080p 60, ideal solution to distribute multiple channels of any HDMI video directly to unlimited SMART TVs, Smart Phones, Tablets, Computers, IPTV Boxes,over LAN, WiFi, Internet. Based on the newest multi-server multi-format Broadcast chipsets technology, each channel can encode the HDMI Input in FOUR different formats & resolutions, as example for SMART TVs, Mobiles, Tablets, PCs, to fit the destination bandwidth and type of network, with the ability to serve directly hundreds of simultaneous unicast or multicast concurrent players without the need of additional parts or servers. Each channel can also load & inject up to Five Graphic Logos or Texts for channel identification, Watermarking, Info, QR Codes for commercial links, etc. The VeCODER delivers incredible video quality and power as each channel comes with its own encoding engine, served over multiple Full Gigabit speed outputs, able to support very high traffic demand on the same channel. The VeCODER connects directly to the existing LAN Switch, or wifi, or internet router and streams the HDMI Video input in super ultra low latency to any device, perfect also for Live Applications. The encoded channels can also be sent directly and simultaneously to any additional distribution servers as YouTube, Wowza, Akamai, and any other, to reach even more audience, unlimited. In Homes, Commercial, Hospitality, a single VeCODER can play directly on any SMART TV over wired Lan or Wifi, without need of any additional part behind the TV - Direct. Multiple VeCODERS can be installed at the same time on the same distribution network, anywhere, adding and expanding the available IPTV Channels at any time. Available in 4, 8, 12, 16 channel configurations, the VeCODER-ULTRA-IP is the perfect solution for any professional Over IP Video Broadcasting and Distribution, where Total Video Quality, Performances, Reliability, and best cost per channel are most wanted.